The News-Press recently reported that the wife of an Estero man who was killed in a late February crash between a truck and a golf cart has died as the result of injuries from the same incident. The woman’s husband was driving the Club Car golf cart she was a passenger in a northbound direction in a southbound lane when the cart was hit head-on by a pickup truck. The woman was reportedly trapped underneath the vehicle and the golf cart which caused her to obtain the life-threatening injuries that she ultimately succumbed to. How Often Do Golf Cart Injuries Happen? Unfortunately, there are no golf cart accident records kept by the Florida Highway Patrol. However, according to data released by the National Electronic Injury Surveillance System, over 147,000 golf cart injuries occurred in the U.S. in just a sixteen year period. Perhaps surprisingly since many of them cannot operate golf carts, over 31 percent of these injuries occurred to children who were age 16 or younger. Additionally, over fifteen percent of these injuries occurred on streets or public property. What Causes Golf Cart Accidents? 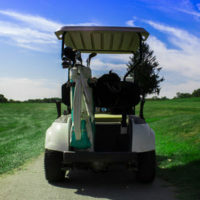 What Kind of Injuries Can Result From Golf Cart Accidents? Why Can Golf Cart Accidents Lead to Such Serious Consequences? While golf carts are considered to be motor vehicles, they lack many of the safety features present in cars. For example, golf carts are open air and the driver and passengers have much less built-in protection than a car as there are no doors and very little body to help shield them from any impact. Many golf carts also lack seat belts, brake lights, windshield wipers, or the ability to signal. Have You Been Injured in a Golf Cart Accident? Then you need experienced and competent legal help. We sympathize with what you have experienced and we offer decades of combined experience that we can utilize in helping ensure you are successful with your claim against the negligent third party who caused your golf cart accident. Contact the experienced Fort Myers personal injury attorneys of The Pendas Law Firm today and we will help you recover the compensation you are entitled to.